The people at NERDSTEAK want to review YOUR product! If you have a food related item that you would like an unbiased review of, please contact us! Contact us and give a little detail about your product. We will provide a shipping address and timing of the review. We will only provide an unbiased review of your item along with unedited photos. We will contact you AFTER our results have been posted to provide you with any links, photos, or information you may need. We will not return any unused or unopened items. We will not review an item if it has been opened, broken, or tampered with in any way prior to our review. We will complete a review with in-depth detail ranging from packaging appearance & functionality, product appearance, eating or use experience, value based on pricing, and overall review with a 1 thru 5 score. You are allowed to use the review for any promotional opportunities. If you need any specific focus on the evaluation, please let us know ahead of time. We like everything from food, gadgets, equipment, clothing, ingredients…basically anything that can relate to food. Examples of our reviews can be found in our previous posts. Packaging Apparence – The product arrived in a sturdy squeeze bottle with an overwrap label, as well as a foil/paper seal under the cap. The overwrap on my bottles were actually a little off-centered. The Traina logo and the sun dried tomato ketchup fonts were a little fuzzy, but the black script and the tomato image looked very clear. My small concerns are that the full overwrap does not allow you to see the product on the inside, and a repeated use of a squeeze bottle with an overwrap label will eventually wrinkle and shift even more. 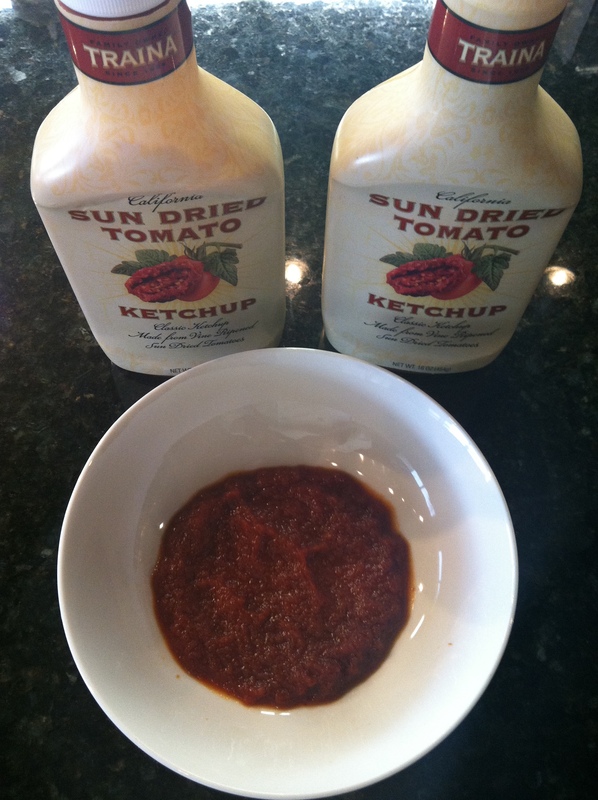 Product Appearance – As expected, this ketchup is not as smooth as the leading brands, however it held together very nice when squeezed into a bowl. There are visible pieces of tomato, but not big enough to be a chewy nuisance. It has a rich, dark red color, and just enough thickness to adhere to foods just like its traditional counterpart. When using it as a condiment for french fries however, you will need to give it a little more scoop action to get it on the fry. Eating Experience – This stuff tastes fantastic! I am a ketchup fan, but this definitely brings it to the next level. It has the deep, natural sun dried tomato flavor you would expect, with just the right amount of natural sweetness. It has a great acidity level, along with just a touch of onion and other spices. I had the pleasure of trying this with homemade french fries, and on a prime beef patty melt. Again, it has just the right amount of sodium which was not overpowering, but complimented everything I ate it with. Even after it sat in a bowl for a while, I did not see any signs of separation. Value – You get what you pay for. A 16oz bottle runs about $4.99 which is much higher compared to the leading ketchup brands, however this was made to be an upscale alternative. The Traina Foods website states it takes about 4 pounds of tomatoes to make one bottle of their ketchup, and sun dried tomatoes themselves already cost more that your average tomato. Overall – I personally think the packaging could use an upgrade, maybe either a printed on package label, or sticker label, but the flavor from the ketchup is outstanding. It has a much greater depth of flavor compared to the high sweet/salty/acid standard brands, a nice texture you would expect from a sun dried tomato product, and even though it is at a higher price point compared to the leading standard brands, it is well worth it! 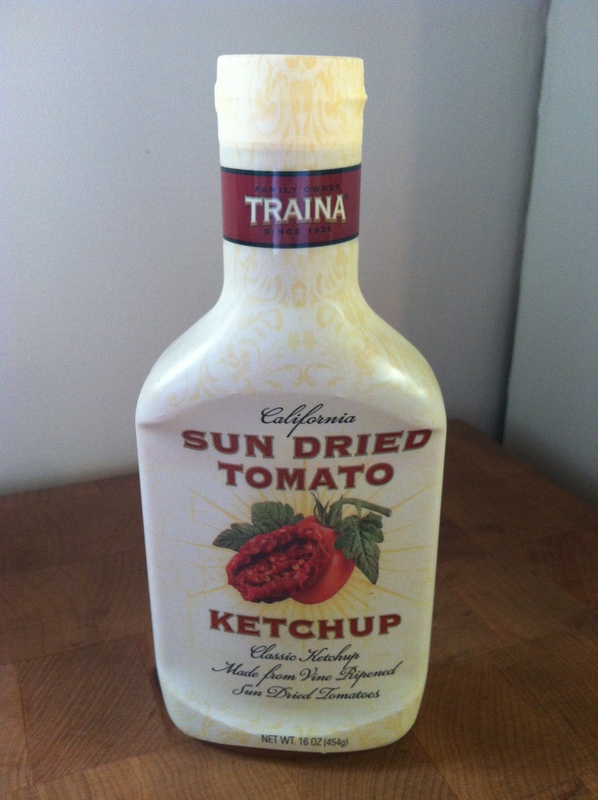 I give Traina Foods® Sun Dried Tomato Ketchup a 4.5 out of 5. Packaging Apparence – The beverages come in nice, sturdy bottles with a matte finish plastic label. I felt that the logo and color scheme appropriately represents this health conscience product. There was enough clear area on the bottle to adequately see the product on the inside, and the top was easy to open. All of the information was easy to read, and promotes having the addition of oat fiber (two bowls worth), along with being vegan friendly, gluten free, dairy free, non-GMO, and kosher. They do not add any ‘boosts’ like the other brands, and rely on only the natural juices for the nutritional value. The ONLY comment I can make about the bottle is that it has a slight raised texture on the base which I though was a wrinkle in the label, but it was the actual shape of the bottle underneath…not a big deal to me. Product Appearance – All of the varieties I sampled had the expected and appropriate color (Strawberry Banana, Peach Mango, Pomegranate Blueberry), but were just a tad duller than some competitive products, as well as the images on their website. They looked a lot smoother in texture than some other RTD smoothies out there which is a plus for me. The smoothies were not overfilled and did not look like anything on the inside settled to the bottom…meaning I didn’t really have to shake it before drinking. This is most likely due to the addition of guar and xanthan gum. I also noticed there were no visible oat pieces or specs in the drink, which again is a plus for me. Drinking Experience – I was pleasantly surprised when sampling each of the varieties. I did not pick up any earthy oat flavor, just a smooth, and sweet profile like the label suggests. They are pretty much spot on with the amount of sweet vs. tart, with my favorite being the strawberry banana. I personally like a little more strawberry flavor in my smoothies, and it delivered just that. I did not pick up any gritty or graininess in any of the varieties, and the consistency was just thick enough to leave a refreshing, bright aftertaste…in a good way. I also felt that the 12oz portion was the perfect size for a beverage like this. Value – After doing a little research, the cost per each bottle is right between the two major brands you would find in the refrigerated section at your local supermarket, however, you have the added benefit of a longer shelf life with these since they do not need to be refridgerated. Now the per/oz cost is a little on the high side, but as previously stated, I think this 12oz size it much better for a single serving, making it a great 160 – 170 calories per bottle. Some of the other brands have a much higher calorie count than that, but just remember this is a fruit smoothie, so you will see sugar kind of high on the nutrition panel…this is to be expected though. Overall – This was a fantastic product that I look forward to having more of in the future. I felt it was the perfect size, the consistency was very smooth without having any grittiness, and the flavor was spot on. The price is on the high side, but in-line with the competition, however you can store it longer since it does not need to be refrigerated. 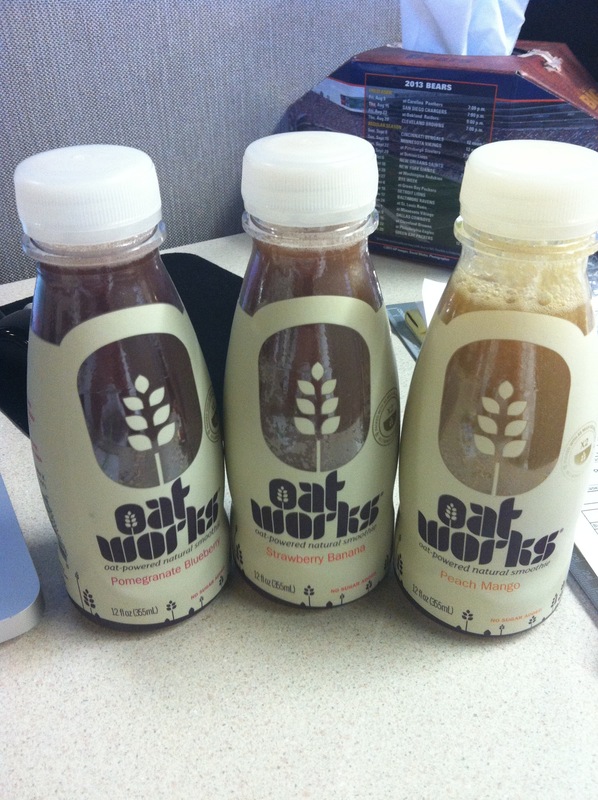 I give OatWorks® Oat Powered Natural Smoothies a 4.5 out of 5! 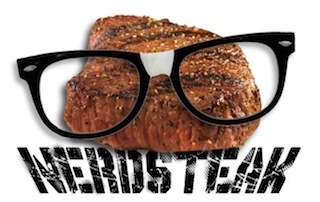 NERDSTEAK is more than happy to review any food, beverage, restaurant, CPG or equipment items you have to offer. Feel free to contact Mike directly at chefman316@aol.com to arrange for shipping of samples, or to schedule a review. 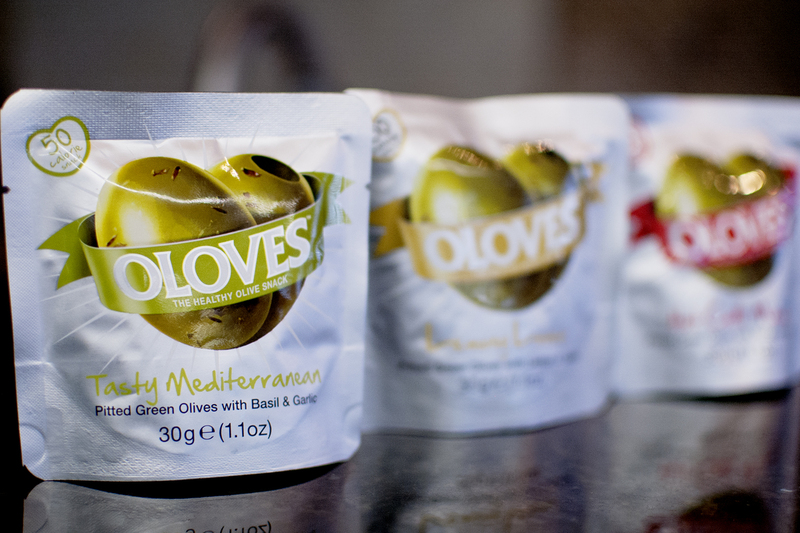 Packaging Apparence – These olives come in a cool silver pouch with a tear away top. It was very easy to open and all of the samples held up very well in the shipping box without the need for much extra packaging. This was obviously produced outside the US with the UK ingredient and nutritional statement on the packaging, but still easy to follow. They have a very nice product shot on the front with a, ’50 calorie snack’ tag on the front. It has a very simple yet upscale feel, along with enough support to be a great traveling snack. Product Appearance – The olives themselves held up pretty well being in a soft pouch with little excess oil or brine, but you will notice that they don’t have the integrity of olives in a glass jar, which is to be expected. I will note that the Mediterranean flavor variety was a much darker green than the Hot Chilli Mama and the Lemony Lover varieties. Nothing on the package noted a different olive variety. I liked that the olives were not swimming in oil or brine making it a better quick snack option. The Mediterranean and the Lemon varieties had the appropriate amount of garnish for what I expected, however the chile version looked like it was lacking in chile flakes. Eating Experience – Starting with the Mediterranean, I felt it had a great flavor with notes of garlic and basil, however the texture of the olives were overly soft. They had just the right amount of tangy brine flavor and did not over saturate my mouth with oil like other olive brands. Still, the olives being extra soft made this my least favorite of the three varieties and If they were the same texture as the other two, it could have easily been my favorite. Next was the lemon variety which had a much better olive texture. There were some interesting lemon pieces in the package which tasty more like candied lemon than fresh squeezed lemon juice, but was still a nice little treat you would not normally find. For me, I could have used just a touch more garlic flavor as well as a more natural lemon flavor in the olives. Last was the chile variety. My first tasty was perfect, great olive texture, just the right amount of heat and a touch of lemon, however my next piece was over the top hot. I noticed that the chile flakes were not evenly distributed over the olives, which makes me believe they added the chile flakes after the olives were brined. This allows for ‘hot-spots,’ not an even amount of heat throughout the product. Also, on their ingredient statement, it showed lemon pieces are supposed to be mixed in with this variety as well, but I did not find any in my particular package. All around experience was very favorable, but felt there could be some small tweaks to make it even better. I will note that I did not find any pits or stems which you can sometimes find in other brands of olives. Value – From what I researched, the cost of these seem to be in line with other pre-portioned olives out there. You will get a better value buying olives in bulk, however with these, you get the convenience of an easy open and transportable snack. They also promote being all-natural, gluten/dairy/nut free, vegan and kosher. 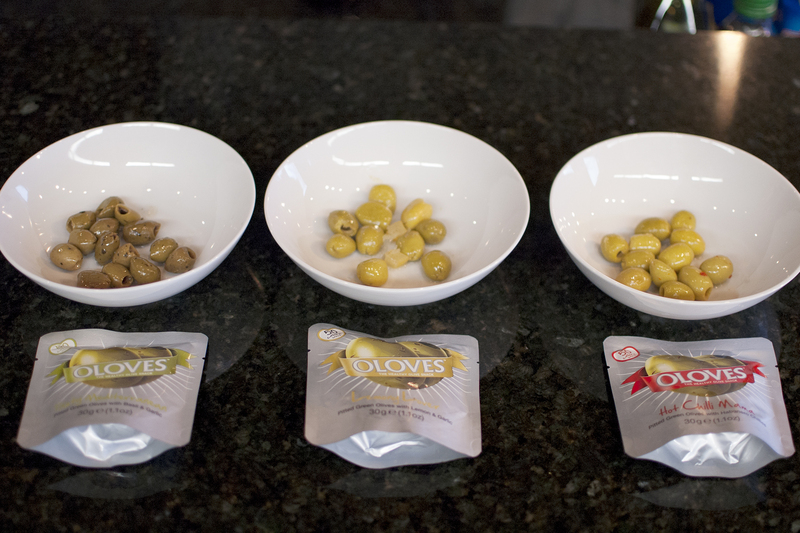 Overall – I had a very favorable experience with Oloves™ olives. I enjoyed the easy-open and fancy looking packaging, the lack of oil/brine to pick though, along with some good flavors. I felt that if the Mediterranean variety used the same olives as the other two, if the lemon variety moved away from the candy lemon flavor, and the chilli variety had a more even heat, this would have been quite the product! I give Oloves™ olives a 3.5 out of 5. We in the food industry love to figure out the best way to sell a product with a romance description, crisp food photography, and innovative packaging, because these are all the things that affect what you buy, before you have a chance to eat it. However, there is always a bit of trickery in this process. This could be hand placed fresh ingredients for the photo, an exaggeration of the flavor profile, and my personal favorite, playing with the standard of identity. 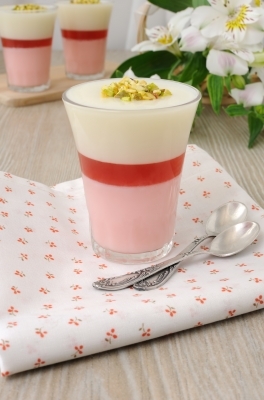 For instance, to call something ‘Greek yogurt,’ it’s traditionally a strained yogurt made with Greek milk with a high protein content, and thicker consistency with less sugar than standard yogurt. This is the standard of identity which must be submitted and regulated before a product can be labeled as ‘Greek yogurt’. You can throw all of that our the door if you label it as ‘Greek-style yogurt’. Now you can add thickening agents, flavors, or other dairy products to have a final yogurt that tastes LIKE Greek yogurt, without having it produced in the standard way. Shenanigans. There are many examples of this in both foodservice and retail establishments. Andouille-style sausage, firebaked style flatbreads…the list goes on. Whenever there is a a regulation in place for a product description, using the word ‘style’ gives us a little leeway. If you are looking for traditional products or ingredients, avoid items labeled as ‘yada-style yada’. The advantage of incorporating the word ‘style’ is that the product is usually at a better price point, last longer, better organoleptic properties over shelf-life, and it some cases, consumers aren’t concerned if it is authentic. I am not saying either is right or wrong, just make sure you know what you are looking for. There are also food items that have NO standard of identity, which then can use whatever they so desire as a descriptor. What are some of your favorite misleading food terms?